Meanwhile, blend all of the dry ingredients into a fine flour using a food processor. Set the coconut oil aside for a couple minutes and let it cool down. Transfer the dry ingredients to a large bowl then add the melted coconut oil, maple syrup and dark rum. Mix well. Using your hands, roll the preparation into 1-inch balls. 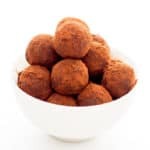 Gently roll the balls into cocoa powder. WARNING: For some people, 4 tablespoons of rum in this recipe might be too much. If you prefer your drinks lighter, I suggest you start with 2 tablespoons, mix, taste and adjust! Also, protein powder is entirely optional for this recipe. You may replace it with 1 tsp vanilla extract. If using plant-based protein powder, reduce the amount of almond flour to 1/2 cup.